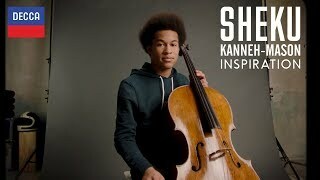 Sheku Kanneh-Mason is one of today's most exciting young cellists . . . and his arrangement of "No Woman No Cry" is pure loveliness -- inventive, sweet and virtuosic . . . Sheku, we crown you the king of reggae-classical crossover. Kanneh-Mason has taken his idol's song "No Woman No Cry" and enfolded it into the arms of the classical genre . . . You get a sense that he is very proud to be presenting an icon's signature song. These are things that make a great musician when you can tell they are completely into what they are doing and play with abandon. No holds barred . . . Judging by the high quality of his work and humble approach to fame, we are sure to be hearing more from this young man. One of the brightest young stars in classical music . . .
. . . a formidable indication of his ambitions . . . [he negotiates Shostakovich's Cello Concerto no. 1 deftly,] moving smoothly from the contorted, capering Allegretto into the involved Moderato, with its wild sweeps between epic and manic, intimate and overwrought.
. . . [a] supremely assured debut . . .
Sheku Kanneh-Mason, cellist winner of BBC Young Musician 2016, is emerging as the player of the moment . . . his debut disc, "Inspiration" (Decca), skilfully combines a blistering live performance of Shostakovich's First Cello Concerto with a range of alluring miniatures . . . Kanneh-Mason sounds best in a wonderful Offenbach track, and in a touching solo self-arranged version of Bob Marley's "No Woman, No Cry". As virtuoso he hits the heights in the cadenza to the Shostakovich concerto, supported by the terrific City of Birmingham Symphony Orchestra (superb horn solos) under Mirga Grazinyte-Tyla.
. . . [a] spellbinding performance of "Song of the Birds" . . . it is a real beauty. This is a cross-section of influences and styles that will have classical fans whooping with joy.
. . . [the sounds Kanneh-Mason produces from his Amati cello] are always heartfelt, often as yielding as softened butter, and they shine out of every track of "Inspiration" . . . [the recording acoustic of Shostakovich's Cello Concerto no. 1] underlines the warmth of Kanneh-Mason's delivery . . . even at the start of his career, nothing masks the authority or technical finesse of his playing . . . [his are] extraordinary qualities . . . Above all, Kanneh-Mason's playing radiates love of life and hope. Even the most mature and penetrating musicians don't always manage that.
. . . heartbreakingly beautiful . . .
. . . this nicely varied programme offers a rounded portrait of the young cellist . . . A strongly felt performance of Shostakovich's challenging Cello Concerto No. 1 forms the centrepiece.
. . . [a] splendid album . . . He has a big, noble tone. He also has virtuosity aplenty, and a vivid musical imagination . . . This whole album is a tribute, not just to his talent, but also to his maturity as a musician . . . [this is especially true of the live recording] of Shostakovich's Cello Concerto No. 1. The fact he has made this tricky piece so much his own speaks volumes for his innate taste and judgement.
. . . Sheku Kanneh-Mason is a phenomenal talent . . . [Shostakovich 1]: the raucous cadenza with solo horn is superb and the slow movement chills. The concerto's closing pages have an ominous weight: there's no hint of triumph despite the major key final chord. How can a mere teenager tackle such a tricky work with so much intelligence and technique? . . . brilliant versions of two Pablo Casals numbers . . . Arrangements of iconic Bob Marley and Leonard Cohen songs provide a fun coda.
. . . [Offenbach / "Les larmes de Jacqueline"]: The playing here, disarmingly gentle yet tonally seductive, has a songful use of vibrato that recalls the expressive manners of Pierre Fournier and du Pré herself. These are among Sheku Kanneh-Mason's most personable qualities, not forgetting a sense of intimacy that wins especially high dividends on tracks that involve the CBSO cellos. Another boon is the featured 1610 Amati cello, warmly captured by Decca's engineers, especially on the CD's opening tracks . . . [Shostakovich / Cello Concerto no. 1]: [Grazinyte-Tyla is] a conductor who evidently prompts her players to listen to each other . . . [Jessica Duchen's booklet interview is] excellent . . . the overall impression is of energetic dialogue and a performance that in its overall profile is marginally more relaxed and certainly more chamber-like than those we already have . . . Grazinyte-Tyia has a keen ear for detail . . . and the musical bonding between her, Kanneh-Mason and the orchestra is deeply satisfying . . . The second movement is the performance's undoubted highlight. A most rewarding CD then, sure evidence that we should henceforth be on the lookout for any performances, either recorded or live, that involve Sheku Kanneh-Mason. Sheku begins the disc with a beautiful Jewish melody, a favourite piece of his which he heard first while playing in his school's klezmer band. Each piece has been carefully selected to show different facets of his playing and this one emphasizes the richness and warmth of it. His approach with Saint-Saens' "Le Cygne" is to draw the notes out in a way that makes the tune sound even more poignant than the notes reveal. Poignancy is also on display in the traditional air that the great Casals arranged. Likewise the same element is to the fore in the gorgeous nocturne Shostakovich came up with for the film "The Gadfly" and it easy to understand why the suite he made from his music for it has had such success in its own right . . .[Shostakovich / Cello Concerto no. 1]: this performance knocked the socks off both audience and judges two years ago enabling him to heft the trophy of this prestigious competition. I have heard many interpretations of this wonderful work which I never tire of listening to and I find new things in it to admire and revel in on each hearing. The overarching impression in Sheku's rendition is his real love for it and that comes through with each and every note. His playing is both muscular and reverent while being able to draw back from the powerful when necessary and inject the most rapturously plangent playing into the performance as he shows to great effect in the second movement which could easily have you in tears. Sheku clearly knows this work very well indeed but at no time does that translate into carelessness and he plays the work as if it meant everything to him amounting to a hugely impressive performance that will have the listener return to it time after time; one can't help speculating on how thrilled Shostakovich himself would have been by it. Of course it helps to have a cello that is up to the job and his permanently loaned Brothers Amati of c.1610 is a superb vehicle to drive this work and both cello and cellist seem as one in the endeavor. It is almost painful to have to leave this concerto when it comes to an end and makes you wish it was longer; it finished all too soon. The CBSO serves the young soloist very well indeed willing him on with some truly magnificent playing with its young and recently appointed Chief conductor firmly in command and rooting for Sheku to show his best . . . the chosen pieces are all useful in showing Sheku's different shades of playing and warmth is again on show with Offenbach's "Les Larmes de Jacqueline" with some beautiful phrasing. Casals' "Sardana" brings a folk element into the proceedings . . . Sheku writes that this is a difficult piece but you'd never know it from the sense of ease that comes across. Bringing something totally different to the party Sheku chose Bob Marley's "No Woman, No Cry" which he arranged himself turning a reggae piece into a beautifully wrought homage to an admired artist who died far too young. Likewise Leonard Cohen's "Hallelujah" transcends the smoky sound of Cohen's voice and becomes a silky smooth work in his capable hands. The CD is entitled "Inspiration" and one can easily see what inspired him in these pieces and he does them all the greatest justice. There is no doubt whatsoever that the name of Sheku Kanneh-Mason is one to watch for he shall surely go far which trajectory he richly deserves. A new recording of Shostakovich's Cello Concerto No. 1 is not an uncommon event; in the past few years we have had excellent versions by Steven Isserlis, Gautier Capuçon, and Alisa Weilerstein. But when it features a 19-year-old from Nottingham, England, performing with a major orchestra on a quality label, attention must be paid. Judging by this Decca release, Sheku Kanneh-Mason, who won the BBC Young Musician Competition in 2016, the first black winner in the competition's history, clearly deserved his victory. Kanneh-Mason's sound may be enhanced by his 1610 Amati cello, but the singular eloquence of the music-making is all his own. Another outstanding feature is the work of Mirga Grazinytė-Tyla the brilliant young music director of the City of Birmingham Symphony Orchestra . . . She gets sparkling and incisive playing from the CBSO in the first and last movements, and finds the ideal balance for the celesta and solo cello harmonics at the end of the slow movement. She and Kanneh-Mason have a wonderful rapport throughout the performance. The program is filled out with some familiar cello encores, with Saint-Saens' "The Swan" making yet another appearance as well as lesser-known short pieces. In four of the tracks, Kanneh-Mason, joined by the cello section of the CBSO, performs very effective arrangements of Yosef Hadar's "Evening of Roses" and several pieces by Pablo Casals. The best of the arrangements are Bob Marley's "No Woman, No Cry" and Leonard Cohen's "Hallelujah" with violist Alinka Rowe, cellist Yong Lee, and Kanneh-Mason in breathtakingly ecstatic mode at the climax of "Hallelujah." By the way, it's nice to see credit given to the horn in the Shostakovich. Elspeth Dutch knocks off the prominent solos with power and fearlessness. In summary, "Inspiration" is a brilliant debut album that leaves one anticipating more fine recordings from Kanneh-Mason.